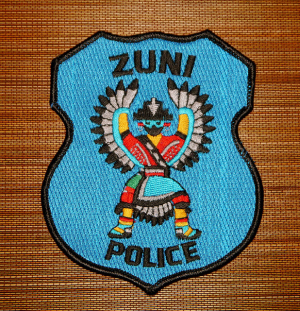 Located in Zuni Pueblo, the Zuni Police Department is the municipal agency responsible for public safety in the town of Zuni . The Pueblo of Zuni Police Department, the tribal police headquarters affiliated with Zuni Reservation, is located in the nearby town of Black Rock. The two Zuni police forces often work in close collaboration with the Navajo Tribal Police, as a portion of the Navajo Reservation, Ramah, shares its western boundary with the eastern boundary of Zuni. anteflxus U.E., photogrpah dated April 11, 2014.